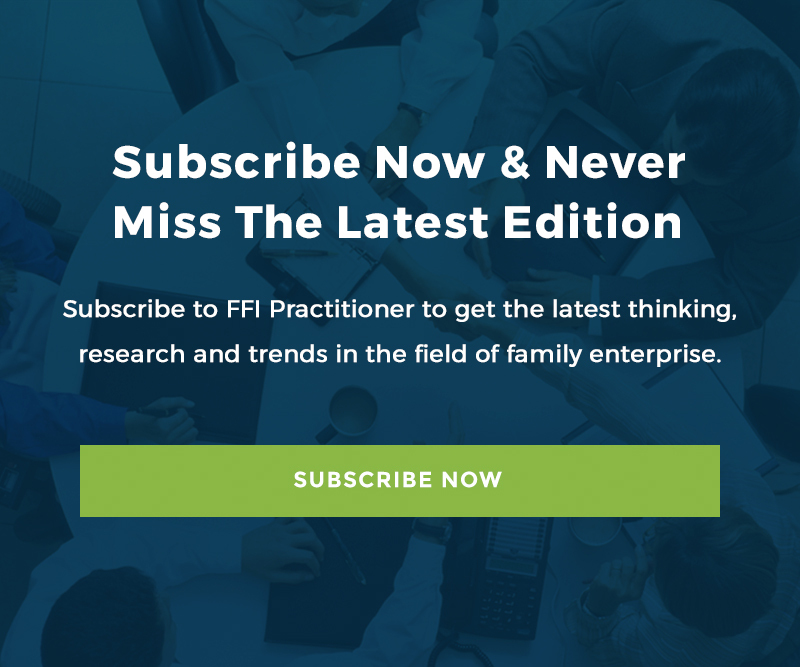 In the second installment of FFI’s interview series, The Practitioner spoke with Joachim Vandaele, CEO of Belgium based social networking platform for families and family offices—TrustedFamily. In our discussion, Joachim described how TrustedFamily’s silo approach benefits both families and advisors alike, why an on-the-ground presence is still necessary in today’s cyber age, and how their approach to social media can be a model for professionals in the field. Without further ado, here’s Joachim, in his own words. The Practitioner: Describe the objective and history of TrustedFamily. Joachim Vandaele: TrustedFamily was established with the objective of uniting families, and keeping them together. It began when the two founding members personally began investigating the legacies, histories, and cultures of their own families, and they discovered there was a lot of information they didn’t know. So they turned to social media to create a secure and trustworthy online platform that allowed families and influential individuals to create cohesion, influence and longevity. The Practitioner: How did your experience growing businesses across Europe, coupled with your knowledge of social media help prepare you to become TrustedFamily’s CEO? What were your chief mandates, initially? Joachim Vandaele: When I came on board as non-founding CEO last year, the business was four years old and doing reasonably well from a product perspective, thanks to former CEO Edouard Thijssen, who’s great at product development. But my focus was more on the business development side, to bring proven concepts into new markets, on an international scale. I’ve worked with many other organizations across different geographies, giving me insight into regional differences, company differences, and cultural differences. Each family has its own legacy, so even though we’re rolling out standard products, every family should implement them in a different way, and that’s something I bring to this organization. I also have experience implementing technology platforms for large financial institutions and I understand that knowing lines of code is not enough to change an organization. It also takes deploying new processes that change the behaviors of people. It’s about going from a product-oriented organization to a more service and solutions-oriented business. I’ve seen how social media can create a “network effect”, where groups of people can find cohesion, but this doesn’t happen naturally or organically. You have to organize it. To build a community of family members, you have to steer the behavior of a few selected individuals, which means finding the family members who can start animated conversations that bring the others on board. These people are almost cheerleaders of new content that’s being created. The Practitioner: TrustedFamily boasts a myriad of applications, such as scheduling events, tracking charitable donations, archiving sensitive information, etc. Which functions are your favorites, and most applicable to practitioners in the field as they work with their clients on social media platforms? Joachim Vandaele: One of the features I find most intriguing is the Family Tree. This is nothing you’d find on Facebook. Some clients have 300 family members going back five generations, so this functionality is actively used by families looking to maintain connections and rediscover family members they haven’t met before. It’s intriguing—especially because it’s linked to the profiles of the family members. I also like how you can organize your life into groups that may or may not be overlapping—just like in real life. You can have an overview of the conversations that are happening in all the groups you belong to. I also really like the “secured vaults”. Family members use this function to store things like real estate contracts, shareholder agreements, even wills. So it’s not only about online interaction. It’s also about data storage of highly-private, critical information. The Practitioner: What new applications can we expect in the future? Joachim Vandaele: We’re adding a Wiki functionality as well as an electronic voting platform—like for shareholders meetings. Most of these features will be utilized by family offices and multi-family offices who want to use the platform to communicate with clients. The Practitioner: How does a platform like TrustedFamily stand apart from other social networking sites such as LinkedIn and Facebook? Joachim Vandaele: First, let me say that we obviously have many things to learn from these other well-known social media platforms. Obviously those sites are leading—simply because of the number of people they deploy and the money behind them. But the biggest fundamental difference between a social platform like Facebook, for example, and TrustedFamily is our business model. Facebook is free, and there’s no barrier to entry. Well, at least it’s free in the sense that you don’t pay hard dollars or hard Euros to join. However with Facebook, you also don’t own your content. Every picture you post is the property of Facebook. So you may not pay with your wallet, but you do pay—with your identity. With our platform, TrustedFamily clients will always be the owners of their own data. Second, and related to the first, we excel in security. In proportion to revenue, some other social networks don’t put a lot of money into security. However, TrustedFamily is more proportionate to secured banking, so we’re constantly investing money into that security layer. Third, we have a dedicated help desk with account managers in place to provide clients with customized support. The Practitioner: Describe how platforms like TrustedFamily can help family enterprise advisors, specifically. Joachim Vandaele: In TrustedFamily, we have a functionality referred to as the ‘group systems’, which enables families to invite their advisors onto the platform in dedicated groups. This gives advisors a window through which they can view what’s happening with the families. The more information they have on this, the better they’re able to serve families. By using metrics and statistical algorithms, advisors can see what triggers their clients’ behaviors—it’s all very useful data. For transactions, TrustedFamily also allows all of a family’s advisors to come together in one space. For example, with a real estate transaction, or a private equity deal, you can have the lawyers, the selling party, the buying party, and maybe even the regulators invited to and engaged on the platform. All of this is organized in a way that controls who has access to that information through one central gateway. The Practitioner: You recently opened a North American office. Why is it important to have an on-the-ground presence in North America? Joachim Vandaele: We operate out of Brussels but we want to be close to clients, so we’re developing the North American market as well as Middle East, Latin America, Japan, and Africa. Continental Europe is already strong. This is a trust business, and we’re the “private bankers” of data. Our clients demand high service levels. They don’t go to see their private bankers; their private bankers go to see them. That explains why we’re building offices in different geographical regions. We don’t want to be an anonymous company. The Practitioner: Thank you for your time, Joachim. Joachim Vandaele: You’re welcome. Thanks for speaking with me! Joachim Vandaele is an entrepreneur with 11 years of experience launching new ventures across Europe. He began his career as a KBC banker in Brussels and Budapest. As a partner and country manager at Finalyse, a leading financial consultancy, Joachim navigated the company into new geographies and successfully launched three subsidiaries. Serving in the senior management body, he designed a new cross-border management model, and introduced a series of operational efficiencies. As a principal consultant, Joachim led multiple implementations of software platforms and modeling methodologies with major banking organizations. He was instrumental in growing a leading media production house in Belgium. At Groupon Benelux, he introduced the social shopping concept in Belgium and France. In October 2011, Joachim was recruited as CEO of TrustedFamily tasked with the job of taking the organization through its next phase of growth. Joachim holds a Masters in Commercial Sciences, a Masters in Banking and Finance, and an INSEAD MBA. Joachim can be reached at www.trustedfamily.net and at [email protected]. Be sure to look for The Practitioner: Wednesday Edition each week in your inbox and online. Add your voice the discussion by using the comment space*, share with others via our social sharing buttons, subscribe to the blog, or become a guest blogger or contributor.